I am writing this while I am drinking a lemsip (it's pretty gross, even if you put a lot of honey in it) with a box of tissues on my side. Did I say that I love autumn and I love the cold? I do! But I don't like the fact that it's flu season too. Sydney has been so rainy and I have enjoyed a few evenings in front of the tv with a doona. Yes, with a doona! I love my doona! I have missed my doona! (FYI, a doona is the Australian version of a blanket. I guess we use the word blanket for the version made of wool but also for the version made of cotton). It's finally cold enough! But now I am feeling sick. Sadface. When you feel sick you cannot be bothered planning your dinner, grocery shopping and standing in the kitchen for hours. Especially not after a long day of work. Especially not when it is raining and you want to put on your onesie and settle yourself in front of the tv (with or without lemsip). That's why we have been using Hellofresh for a while. So I don't have to think about what we will eat and so I don't have to make grocery lists. Another major reason was that MrBehomeforT was always complaining about my choice of food if it would happen to be something with ingredients he does not like. For examples, vegetables. Or something vegetarian. So I thought, if I don't decide what we get to eat, then at least he cannot blame me if it happens to contain vegies or some other ingredient he doesn't like. Hellofresh brings a box of ingredients and 3 or 5 recipes to your door. It's simple. Every Monday there is a box with ingredients and the recipes and we are set for 3 days of the week. No need to think about food and grocery lists. The food is often quite healthy and sometimes there are no carbs so it is diet friendly. FYI I am not asked to promote Hellofresh. They probably don't even know I am writing this blog. But we are happy with the ingredients and the service and it just makes things so easy. Yes, one time the box was delivered with the neighbours who left it in their garden. And yes, sometimes ingredients are missing and sometimes there are meals that you don't love. But it is still the most convenient options. Sometimes the box contains exciting ingredients. Something I have never cooked before. Like this quail. I have been wanting to cook quail for a while. But it just never happened. Until this box containing quail arrived at my doorstep. So I made it. And it was delicious. And it was easy. And the plate was empty within minutes. Great success. Dress the quail with balsamic vinegar and oil, and place in a medium hot pan for 2-3 minutes on each side. Salt and pepper on top. Done! 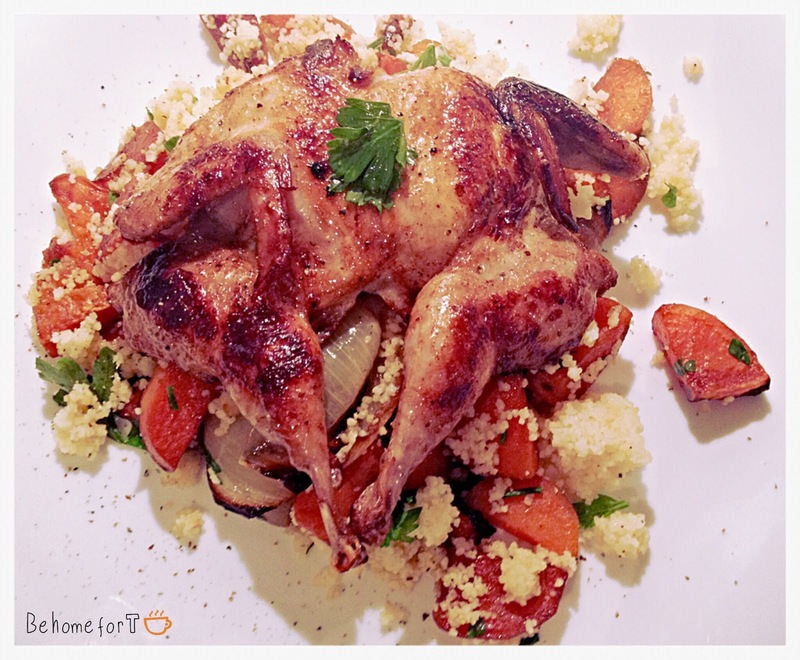 Mix the couscous with the sweet potatoes and serve with the quail. Don't forget to put some salt and pepper and the parsley on top. Want to have it with something extra? What about persion fetta, or roast mushrooms, or even some roast zucchini. This should not take you longer than 20 minutes in total. So easy. So simple. So good.